Royce Harlan holds up his record Lake Texoma bass. The arrival of spring often brings warmer weather, blooming trees and, at least in Oklahoma, a big lake record fish. On March 3, Royce Harlan of Kingston hauled in a 12.4-lb. largemouth bass from the waters of Lake Texoma, nabbing that lake record spot and setting the stage for a great fishing season. The Oklahoma Department of Wildlife Conservation's lake record fish program was initiated in 2008 to recognize big fish from certain lakes and the anglers who catch them. The program has grown from about a dozen lakes at its inception to more than 40 lakes today. So while anglers all over the state can go fishing just for leisure, they also have a chance of putting their name in a record book. 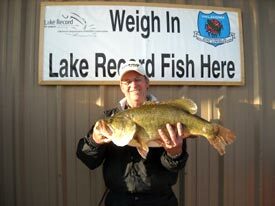 Other lake records nabbed by anglers recently include a 2.6-lb. crappie caught March 7 at Hudson Lake by Big Cabin angler Roger Moseley and a 5.8-lb. saugeye caught at Shawnee Twin Lake #1 by Jed Davidson of McLoud. Fish species eligible for spots in the lake records book include blue, channel and flathead catfish and largemouth, smallmouth and spotted bass in addition to crappie, paddlefish, striped bass, striped bass hybrids, sunfish (combined) walleye/saugeye and white bass. Minimum weights are set for each species and are detailed on the Wildlife Department's website at wildlifedepartment.com. Anglers who catch a potential record from a participating lake should contact the lake record keeper for the lake - usually a business located near the lake. Once it has been determined that an angler has landed a record fish, the media is notified and the public will be able to view information about the catch on wildlifedepartment.com. All past and current state record fish are registered in the lake record fish program as records for their respective lakes.